I have been writing about hidden depression. The person who no one would suspect, behind those smiling eyes and cheerful, “Good morning!” was thinking of driving off the road. If it weren’t for her kids. Or his family. 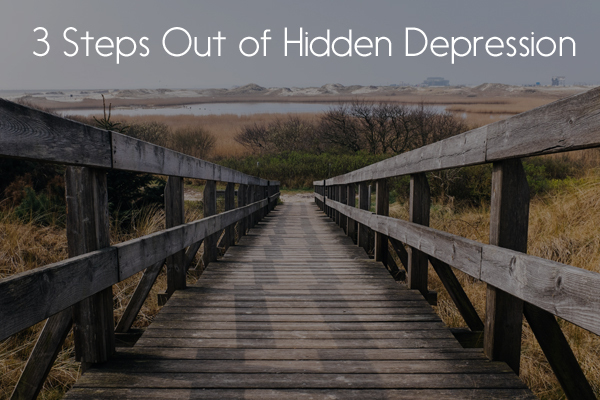 The 1st post was about identifying yourself as a “perfectly hidden depressed person” or PHDP. The 2nd, the diverse ways in which people find themselves in that boat. I am sure there are other paths. 1) Tell someone what’s really going on inside you. A therapist. A trusted friend. Your partner, although somewhat contradictorily, this might not be your 1st choice. More on that. Just letting someone know can feel like a huge relief. But it’s hard. Letting go of that persona you have so carefully built. It’s like Harry Potter’s cloak that makes him invisible. To give it up feels like you are suddenly vulnerable to all kinds of danger. What would it really be like to admit that you are tired? Sad? Bored? Or angry? To let yourself realize what you might want instead of what everyone else does for a change? A common reason given for not talking? “I don’t want to worry (Jane or Joe…) about me”. That’s just not true. People do not have to take on one another’s troubles when they listen. That is pure rationalization to keep covered up. If I had a quarter for every time I had heard this the last 25 years, I could fly to Paris 1st class and back. There’s a HUGE difference between being selfish and being self-aware. If you are aware that you are running on empty, you need to take just enough time to nourish yourself somehow back to a place where you have something to give. 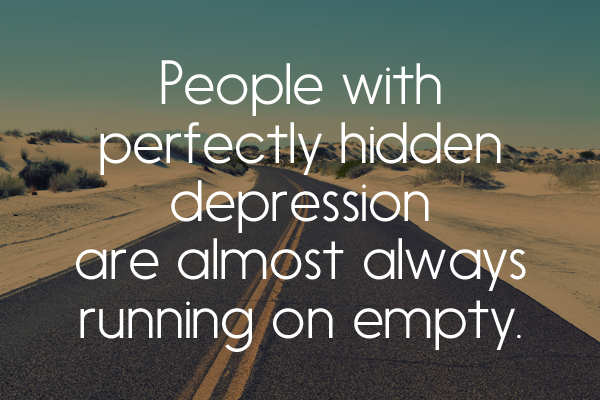 People with perfectly hidden depression don’t know how to do that. They are almost always running on empty. Maybe that’s going for a jog. A massage. Going to the store without kids! Maybe that’s a babysitter. Maybe that’s asking a friend to take your kids for a night (you’ll do the same for him/her) and having the house to yourself. 3) Realize that change might not initially be welcome. News that you are extremely depressed might not be welcome. Sometimes our partners are invested in us staying the same, not necessarily out of malice. Your depression may keep your head down, or your eye on the ball. You’re not complaining, and infact, you’re getting lots of things done. All “seems” fine. It’s the status quo. Change can be difficult. Scary. If you talk about being depressed, you’re upsetting the apple cart. But it’s worth it in the long run. Because you cannot stay this way. You are not thriving in your own life. You may not be truly enjoying anything around you, your children if you have them. Your work. Your friends and family. Everyone is suffering. They just might not be aware. In fact, depression can be “caught” according to highly regarded international expert, Dr. Michael Yapko. You and your partner might have to renegotiate roles you are playing. With children. With jobs. With one another. As Dr. Yapko states in the video above, good psychotherapy can be extremely helpful. So can other things like regular exercise, getting enough sleep. The stuff your grandmother told you. The right nutrition. Spiritual practices. If you are using substances for a temporary “fix.” that issue needs to be addressed. Using those might be compounding the problem. Medication is sometimes necessary. Not always. In fact, not in many cases. The good news is that you can feel better. If you are in a relationship, you can feel more connected. And your family can function in a much healthier manner. These 3 steps are a beginning. The beginning of a journey where you will start to know who you really are. Send this post on if you know someone who could benefit from it! Thank you for reading! Would love a comment below. Or you can always privately ask a question or comment at askdrmargaret@146.66.99.73. Or SUBSCRIBE in the gray box above. Subscriptions help me know how many folks really are invested in me continuing to write the blog!